Fourteen of the sixteen children’s books I’ve written are out now. All are non fiction. Interesting note: These books were all written “for hire,” which is kind of like freelance. I don’t make any money off the sale of the books, so I’m in a unique position. Unlike most authors, it makes no difference to me, financially, if you buy any of my books. I believe in them, yes, and think you’ll like them, but you won’t hurt my feelings if you don’t buy ’em. So there’s no hard sell here. I’ve included direct links to the publishers, if you’re inclined to buy, but there are likely cheaper places to find the books. Again, you won’t offend me if you bargain shop by Googling “author Bitsy Kemper” or “books by author Bitsy Kemper” and seeing what pops up. Sometimes you’ll see editions in foreign languages and that’s always fun to see. Also, let me be up front. These books aren’t cheap. All the ones in print so far have been published for the school and library market. That means not just hardcover but extra tough binding, triple stitching, and lots of other preventative measures that will help prevent the book from falling apart when it’s passed around from sticky kid to sneezy kid, from classroom to classroom, home to home, library to car, kitchen to backpack, year after year, etc to etc. They’re expensive to make and therefore expensive to buy. Toss in some shipping fees and you might want to buy in bulk. Teens and Phobias: 2018 Award winner! My most recent books are for high schoolers. One is an award winner! Teen Mental Illness: Phobia was a 2018 winner from the Northern California Publishers and Authors (NCPA). Cutting Edge Careers: Software Engineer is a great read for anyone considering a career in that field (and my research is one of the reason my daughter is NOT majoring in it!). A series of chapter books written for grades 1-4, are at a general grade 3 reading level. They are country books, written about the history, culture and daily life of Sweden, the United Kingdom, France, and the Philippines. “Intriguing text, informative sidebars, detailed maps, and full-color photographs give readers a glimpse into life in these unique countries. ” There’s also a glossary of keywords and phrases, a fun fast-fact section, and a list of sources for further research. The books came out this year, 2016, and are part of the the “One World, Many Countries” series by The Child’s World, an independent publisher that’s been publishing books for schools and libraries since 1968. If you’d like to buy those country books, click the book covers and it’ll take you to a direct link to the publisher. Another chapter book series came out late 2015 with Lerner Publishing Group that focus on teaching youngsters ages 8-11 (grades 3-5) about the value of money. More importantly, it teaches them the value of SAVING that money. They’re written at a third grade reading level. As an econ major with an MBA, and as someone who loves a good deal more than a great pair of shoes, the topic is close to my heart! “As part of the Searchlight Books™ collection, this series sheds light on an important economics topic—How Do We Use Money? Clear text, informative diagrams, vivid photos, and real-life examples will help you find the answers! Books feature Charts/Graphs/Diagrams, Full-Color Photographs, Further Reading, Glossary, Index, Photo Captions, Table of Contents, and Website Lists.” Lerner Publishing Group is one of the nation’s largest independently owned children’s publishers with more than 5,000 books in print. For more than 50 years, they’ve created nonfiction and fiction books for preschool to young adult readers and for libraries, classrooms, and homes across the country. Ever wonder about your constitutional right to privacy? Well neither did I before writing this book, but it’s honestly fascinating. This 112-page YA (young adult) title written for Rosen Publishing is for 7th-12th graders. It was released in 2015 and talks about a topic hard to understand, in ways teens will want to listen. No, really. It’s a good read, I worked hard to make it so. With a sixty-five year tradition of independent publishing in the school and library space, Rosen has all kinds of interesting topics in their Interpreting this Constitution series. The first four books I wrote were written in 2006 for Picture Window Books, an imprint of Capstone, and are part of a series that take kids on “virtual field trips” to places they don’t typically get to see. Parents and teachers can read these books when they are about to go on a real field trip to these locations—or perhaps even better—parents and teachers can read these books to kids instead of making the actual trip (think of the gas money you’ll save!). 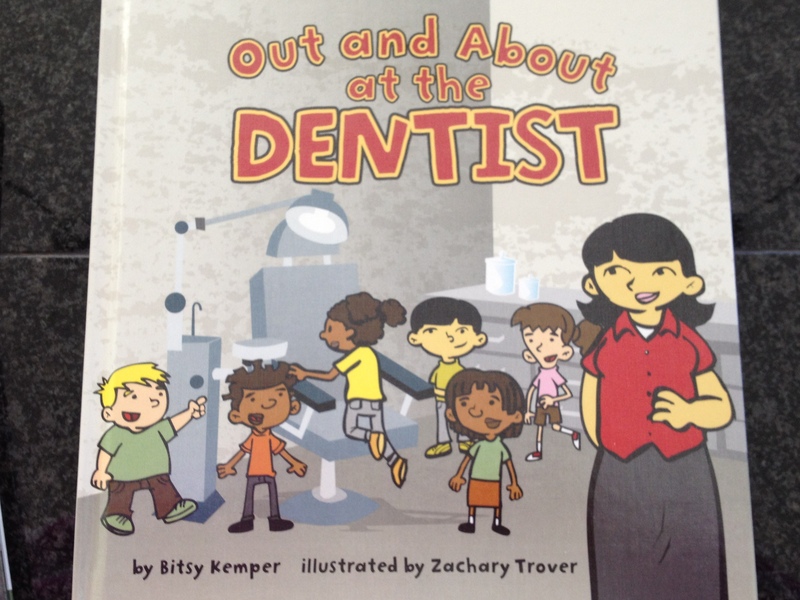 In “Out and About at the Dentist,” kids go on a guided tour of a dentist office to learn about X-rays, see where equipment is sterilized, and find out the best ways to avoid getting cavities. Do grown-ups have more teeth than kids? When do most kids start losing their “baby teeth”? Meet the office manager, both the dental assistant and dental hygienist, and Dr. Lucy Toothy (get it — loose-y tooth-y? Ha ha). With the practical activity at the back of the book, kids will look forward to keeping their teeth healthy. 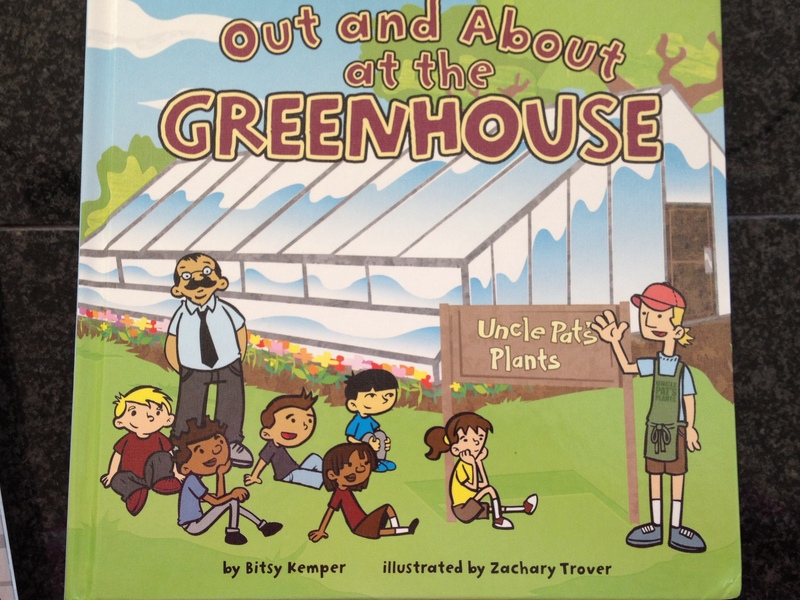 In “Out and About at the Greenhouse,” learn how greenhouses work, why some plants need warm air and some prefer wet air, and see what it takes to keep plants happy. You’ll meet a horticulturist and find out what kind of schooling you need to become a plant expert (you may be surprised!). Experiment by making your own sample greenhouse with step-by-step instructions. 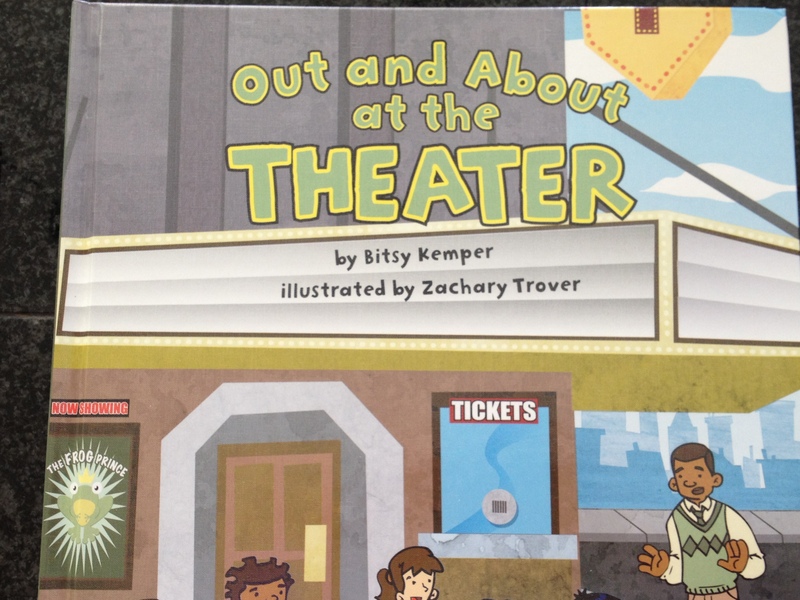 In “Out and About at the Theater,” go backstage and see what happens before the show starts. Visit the costume shop, see catwalks and trapdoors, and find out if the “Green Room” is really green. What does a stage manager do? Who, besides a director, helps put on the show? How big is a real Broadway theater? Your guided tour will get you excited to see your next live performance, whether it’s community theater in a small town or a professional show in a big city. In “Out and About at the Baseball Stadium,” your all-access pass gets you under the stands and into the clubhouse, training room and dugout. What’s a “clubby” and what do they do? Are bat boys and bat girls important? Who takes care of the field? How many football fields can fit inside a typical stadium? 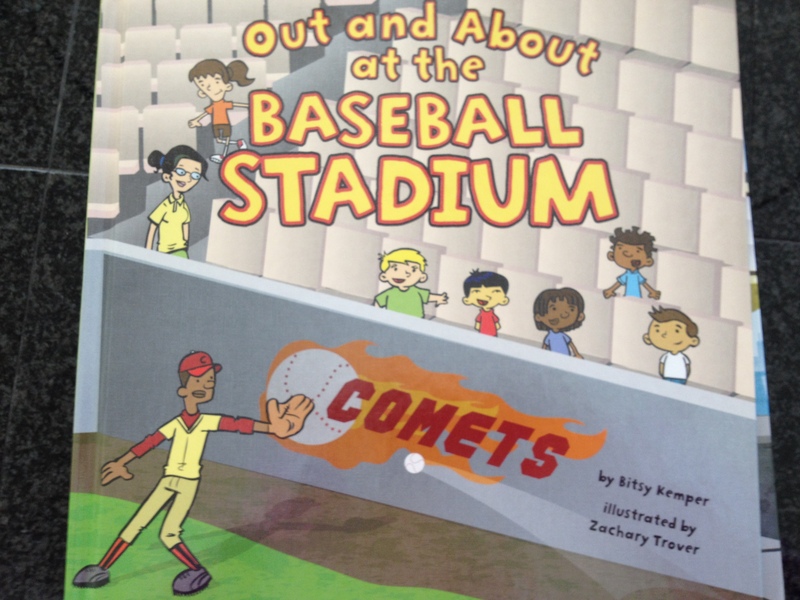 With stats on both minor league and major league teams, you’ll be hungry for a hot dog by page 24.